I missed the big kick-off for this season, the huge juicy sweet onions have been available for a few weeks by now. But there’s still time to get your fill of one of Washington’s hallmark agricultural products: the delectable Walla Walla sweet onion. They’ve even been officially name-checked by the USDA since 1995, to assure that the name is attached only to true Walla Wallas from distinct geographic scope. It’s reminiscent of the European practices that verify authentic regional foods—such as France’s appellation d’origine contrôlée designation for everything from wine to sausage. French soldier Peter Pieri is credited with bringing the seeds of an Italian sweet onion from Corsica to Walla Walla, Washington in the late 1800s, where the community of Italian farmers helped spur the production of this distinctive onion. The growing conditions proved ideal, the “sweetness” coming from a reduced level of sulfur in the onion, which leaves the onion tasting sweeter than similar yellow onions. 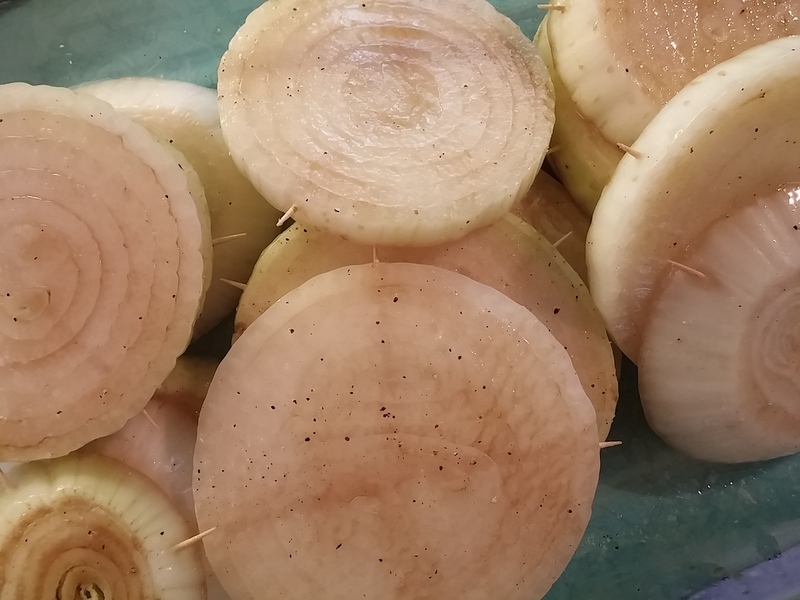 Because these onions have a relatively high water content, they have a short shelf life, making them a treat to enjoy while in season, through most of the summer. They’re pretty broadly available through the region, at Metropolitan Markets you can get onions from Locati Farms, whose patriarch worked with Pieri in those original fields. I picked up a bunch of the onions recently and have been working my way through them. Cut in thick slices and seasoned with a light marinade of white balsamic, olive oil, salt and pepper, I grilled a bunch to accompany grilled sockeye salmon and local albacore tuna. I was too busy enjoying that meal with my family to remember to take ‘after’ shots, sorry about that. (Do you know that toothpick trick? You might note the picks sticking out of those marinating slices, inserted through all the rings [they’re not always perfectly concentric] at the halfway point of each slice, 3 or 4 around the slice; it helps hold the slices together as they’re maneuvered on the grill.) Tonight some slices will be going onto pizza to be grilled. This recipe below is one I did for my Salmon cookbook originally released in 2005. I recently re-released the content from the Northwest series that book was part of, in eb00k form with smaller, themed books. You’ll find it among the salmon recipes in Main Courses from The Northwest Cookbook Series, which also includes recipes using Dungeness crab and wild mushrooms. In this extraordinary summer Seattle heat, I know I’m not too motivated to do any deep-frying. But hopefully you’re somewhere cooler (maybe even A/C in your kitchen? that sounds dreamy…..) or may be before long. It’s a double-whammy of summertime treasures together in a luscious indulgence. For the tartar sauce, combine the mayonnaise, pickle, shallot, parsley, vinegar and pickle juice in a small bowl and stir well to blend. Season to taste with salt and pepper and refrigerate until ready to serve, preferably at least a couple hours in advance to allow the flavors to blend and develop. Cut the salmon fillet into slices about 1 inch thick on the bias; if some of the pieces are quite large, cut them in half crosswise. Separate the onion slices into individual rings. Heat a few inches of oil to 375°F in a large, deep pot (the oil should not come more than halfway up the sides of the pot). Preheat the oven to 200°F. Line a baking sheet with brown paper or paper towels. While the oil is heating, make the batter. Combine the flour, baking powder and salt in a medium bowl and whisk to mix. Whisk in the ale, adding a bit more ale or a splash of water if needed so that the batter has the consistency of heavy cream. When the oil is heated, dip 4 or 5 of the onion rings into the batter and evenly coat, then lift up and allow excess to drip off. Carefully slip the rings into the hot oil and fry until nicely browned, 2 to 3 minutes. Scoop out the onion rings onto the prepared baking sheet, sprinkle lightly with salt and keep warm in the oven. Continue with the remaining onion rings, allowing the oil to reheat between batches as needed. Dip 3 or 4 of the salmon pieces into the batter, allowing excess to drip off and slip them carefully into the oil. Fry until nicely browned and the salmon is just cooked through, about 3 minutes. Transfer to the tray with onion rings and repeat with the remaining salmon pieces, allowing the oil to reheat between batches as needed. To serve, arrange the salmon pieces on individual plates with the onion rings alongside, add a generous dollop of the tartar sauce and garnish with lemon wedges for squeezing.